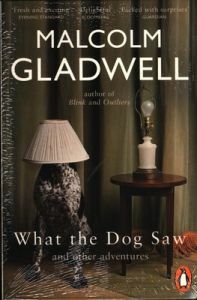 About The Book Consolidating some of his all-time favorite writings from The New Yorker, Malcolm Gladwell came up with a set of 19 epic articles titled What The Dog Saw And Other Adventures. It has the capacity to engage the reader's mind with his captivating subject matter. The book showcases the lives of people who do important things, yet remain anonymous. His persuasive way of bringing such stories has succeeded to hook each reader to each page. The book, What The Dog Saw And Other Adventures, presents the mixed life events of the dog whisperer, who possessed natural magic to calm wild animals down with a mere touch of his hands. It also speaks about the life of the one who invented a birth control pill and the one who invented the pasta sauce. None of them managed to earn recognition, but are extensively cited in the book. The stories are segregated in three interlinked sections, wherein each section has a theme of its own. The author, Malcolm, has put across the readers a revolutionary, yet unique idea of writing. He has presented the unquoted adventures of the lives of individuals who were not duly recognised. Malcolm has brought into light a buoyant purpose with persuasive curiosity that tags him as one of the most sought-after writers in this genre. Penguin publishers got the re-issue edition of this book released on 1st August, 2013, in Paperback.